The Meeting was held at St Edburg’s Church Hall, Bicester. Sixty two members and five guests were present at the meeting. Bob Hessian introduced Liz Woolley who examined the role and implications of child labour in nineteenth century Oxfordshire. Children living in rural areas tended to carry out different work related activities to those living in the urban environment. George Dew reported a child residing at Cottisford working at the age of seven as late as 1873. This raised issues of work v education and the attitude of the local Board of Guardians to such matters. Child labour in the industrial towns, including mills and mines, was easier to observe than when it was hidden in the rural countryside. The lack of documentation has made the study of child employment difficult to study. Sources exist in the form of school log books, apprenticeship ledgers, diaries and memoirs, newspapers, photographs and census returns. Work encompassed employment that was paid or unpaid or for an employer or family where an income helped to support basic family needs. The school leaving age was gradually raised during the period. Over twenty thousand males were employed in agriculture in 1861 in Oxfordshire. Of these 16% were under the age of fourteen. Three thousand were in the 10 to 14 age group and three hundred were aged under 10 years. Girls tended to work part-time in agriculture. School log books record children being absent to assist with harvesting, haymaking, gleaning, potato picking and even baby minding whilst their parents worked in the fields. If the weather proved bad the dates of the school holidays would be altered to accommodate the needs of the situation. Additional rural tasks included gathering acorns for pigs, willow rod striping, goose plucking and bird scaring. Laws were enacted to control working conditions for children but these proved difficult to enforce in rural areas. Many girls left school to find employment as nursemaids or domestic servants. This often meant moving away from home. In smaller households the girls were expected to combine a range of tasks that would have provided individual focus in larger households. It was often a lonely and frightening experience for those of a young age who had not left home before. Lace making was less important in Oxfordshire than in Buckinghamshire. There was over two thousand lace makers in the county recorded in the 1851 census. In centres such as Souldern it was recorded 53 were employed at this task. Many were part-time workers. Lace making schools were part of the community structure and three were located in Souldern in 1851. Conditions in the schools were poor. Young lace makers suffered ill health, endured long working hours and were given allowed limited physical exercise during their studies. Regulations to improve working conditions for pupils were introduced in 1867 but were difficult to enforce. The market for handmade lace contracted with the advent of machine made products. 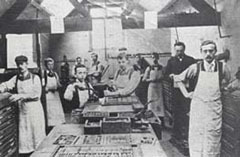 Glove making centres existed in the county, mainly in the Woodstock area. The trade was often passed on from mother to daughter. There were six glove making factories in the Oxford Road in Woodstock alone! 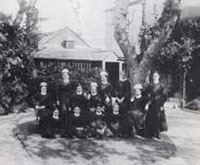 A range of other occupations practiced by children included finishing partly made clothing garments in Abingdon, making blankets in the Witney area, brick making at Headington Quarry, laundry work in Oxford, domestic servants and printing tasks at Oxford University and chimney sweeping, newspaper sellers, errand boys in local towns. Children were apprenticed to local employers at an early age. At times they were sent to neighbouring counties for this purpose such as to Benjamin Smart to become cotton spinners in Warwickshire of mining apprentices in Dudley. Child labour was characterised by agricultural or domestic service with small scale employers on a casual or full-time basis in the nineteenth century. Some children were sent away from home and education was neglected for many. The factories and mines employed larger numbers of child workers. Working on the land or in domestic service was no soft option. It was not until the twentieth century that conditions for children genuinely improved. Liz answered questions at the completion of his talk. The evening concluded with a raffle and refreshments. The Meeting closed at 9:42 pm.